I think this is probably one of the best Halloween ideas I have seen so far! I love it! If your kiddos are too young to craft, you should still consider doing this project. Yes, you will end up doing all of the work putting it together, but it will definitely be worth it! 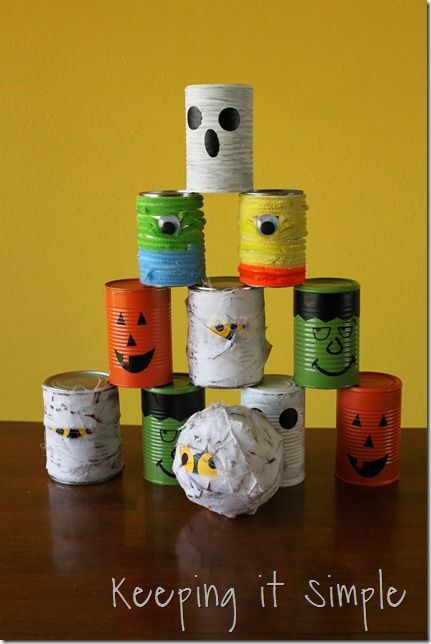 Just think of how much fun your little one will have knocking down a pyramid of tin cans with their spooky, mummy ball! In the next couple of days, I plan on making this game for my 11 month old babies. If it turns out cute, I will post pictures on my Facebook page. This great idea comes from Keeping It Simple. Make sure to visit Kaysi’s website for more awesome craft ideas!